What is a good moveset for Gengar? If you have a good competitive moveset for Gengar, post an answer below and upvote the best ones. Movesets for any of its pre-evolutions can also be shared on this thread. Gengar Pokédex and learnset for reference. Why has no one put destiny bond? Focus sash and destiny bond is a brilliant combo! This move set is actually pretty good since Venoshock and Hex benefit from Toxic, doubling its 65 power to a whopping 130 and Toxic to finish the job if it survives a hit. Destiny Bondade is better to take a fiel with you also Explosion is physical so it won't do many damage and it's normal type so it don't affects ghost types. I prefer a Swepper Mega Gengar it's a monster so powerfull. Will's Gengar is better, but this is also a useful set. Shadow Ball and Sludge Bomb provide STAB. Thunderbolt and Giga Drain provide type coverage, while Giga Drain also heals. 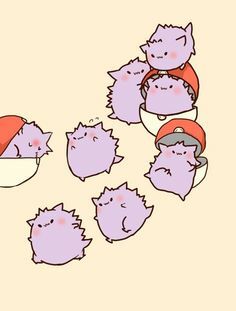 Gengar isn't the fastest thing around anymore, but it should outspeed the foe with Choice Scarf. Sweeper EVs. My Gengar is also the same but with the extra four EV's on Health. Gawd... some guy set me up with hypnosis, he battled me when my team was unfinished and full of pokes i didnt want to use. And freaking hell! Hypnosis doesn't even need a turn to kick in, this is why i need a jolteon or something in my team-outstanding speed. Put your opponent to sleep, trap them with mean look, give them nightmares, Confuse them/eat dat/attack dat, he mad yet? Brick Break or Sludge Bomb (to cover weakness or more STAB) whichever one you want. Instead of Brick Break, go with Focus Blast. Otherwise, good moveset. A Gengars move set is an very easy question to answer! Thunderbolt - Signature Gengar move, MUST HAVE. Make em your play toy. T-Bolt is not the signature move of Gengar. Ummm...since when was Thunderbolt Gengar's signature move? What about Pikachu, Mewtwo OR quite a lot of other pokemon. Dream Eater-Decent coverage. It provides healing also, makign Gengar bulkier than normal. Giga Drain-coverage. It also provides healing. This is best Gengar moveset for me. Shadow Ball, Taking care of opposing Ghost and Psychic type Pokemon, Being STAB. Focus Blast, If you didn't know, A Ghost move along with fighting provide at least neutral coverage on every Pokemon. Covers Steel, Rock, Dark, Ice and and Normal. The drawback is the shaky accuracy, Nevertheless, Better than Hidden Power Fighting. Thunderbolt hitting super effective on Water types, Flying types. Sludge Bomb is strong STAB. If you can manage to get Toxic Spikes support, Venoshock is even stronger. Trick can ruin your opponent, A plus if Gengar gets something good. Nice moveset, should this Gengar be Timid or Modest or can be either nature? If you are running trick it's probably better to go with timid nature. ?What would you recommend I change it too? Might change focus blast to drain punch, should I? This is what I did except I had Energy Ball instead because I can't get Giga Drain. Okay, this is a basic Special Sweeper If I've Ever seen one. HP Bug - Takes down Dark Types, Fighting is also reasonable. It doesn't have to have an Eviolite, it isn't a rule set in stone. Eviolite would take Haunter's depressing 45 and 55 defenses up to a worthless 67.5 and 82.5 respectively and he's not getting any bulk EVs beyond the 4 HP EVs so Life Orb is a lot better so Haunter can dish out some nice damage. Total beast in the NU meta game. Hypnosis puts them to sleep, leaving you with a powered up Hex or a Dream Eater recovery. Sludge Wave is STAB. Nature and EVs make him slightly bulky. This guy is a beast in the NU Meta game. Not a fan of the clashing between Sludge Bomb and Hypnosis. That could put you into some annoying situations against tricky typings. Well, here's a naturally beasty ghost, joining the rain squad. While he has to compete with Jellicent, who has boosted STAB ( Much needed ) he gets Thunder instead of Thunderbolt and a new HP option, that packs a punch. Hex is my choice of STAB, just because I love the move and it's general idea ( Thunder has a 30% chance to paralyze, so I can always take chances ) but Shadow Ball is a completely fair replacement if you don't like taking those kinds of chances. HP Water is coverage, while you can sub this for something like Giga drain to break up Swamperts, Quagsires, and the devistating Gastrodon, murderer of all rain. So that's always an option, it makes him a definite anti-water if you take onto that. You can also consider Black Sludge as an item if you pair him up with Giga Drain. Focus Blast is your last move slot, Fighting + Ghost coverage is known for being pretty beastly, and that high powered coverage just gets me. I've experimented with Wide Lens with Thunder and Focus Blast, considering that some people can stop my weather, and that screws Gengar all up accuracy wise, but I preffer Life orb. Wide Lens still can work, if you aren't good @ weather wars :D While if you sub in Giga Drain for HP Water, HP Fighting can be fufilling. Water Absorb that raises Sp.atk is called Storm Drain. Lol, I know that. I mean I've heard the item will make water attacks not hurt you until it's consumed. Absorb Bulb doesn't grant immunity to Water type attacks. Figured that out recently, meant to edit that, I'll get to it now. Wow I can't believe no-one has done a set that involves the move trick. but in this case Trick should only be used on Physical Pokemon obviously. Will-o-wisp can annoy Physical Pokemon even more by cutting their attack, while Hypnosis puts them to sleep and allows you to KO them easily. Shadow-ball is the STAB move. HP(Fighting) deals with Steel, Normal, and Dark types that would get in the way otherwise. Sub Petaya Gengar is a new set I have been trying out, and it makes a great sweeper against slower teams, and even some faster ones. The idea is that Gengar already has great speed, so Substitute protects him from being revenge killed by things like Starmie and Priority moves, while also lowering his HP down to activate the Petaya Berry, raising his SAtk and making him extremely deadly. Pretty straight forward, for the 3rd slot, Thunderbolt and Giga Drain would be for coverage, Giga Drain would be nice for getting you HP back but Thunderbolt hits a little harder, while Pain Split would be for the purpose of regaining HP and doubling as a Sub-Split Gengar. Pretty generic set. The wide lens boosts up the accuracy of thunder, focus blast, and hypnosis, making him a powerful, but still slightly risky sweeper. Then again, every sweeper is kind of risky. 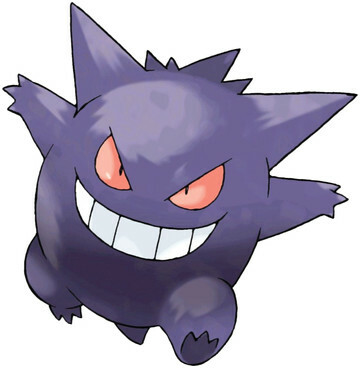 Gengar is one of the most popular double/triple battle Pokemon due to it being a Ghost type with Levitate. It has taken a hit from the last generation with the weakening of Explosion though. Icy Wind hits multiple foes and slows them down. Shadow ball is STAB. Thunderbolt and Focus Blast are coverage. It seems that he posted it before you. Stop trying to accuse people of stuff that they didn't even do. Agreed and stop correcting people all the time. Shadow Ball is STAB, and Focus Blast is good coverage. Taunt stops foe's from setting up, and it stops most walls/stallers/clerics in their tracks. When you are certain you will be KO'd on the next move, and you can't KO the enemy first, you go down fighting with Destiny Bond. NOTE: This set is more of a suicide assassin, as you will likely be KO'd after taunting, which gives you a great oppurtunity to use Destiny Bond. Then wouldn't Focus Sash be a better option?? yeah but unless you are leading with him hazards usually take that away, and even then sand can take it away. Also, when people see the sash they tend to predict Destiny Bond. The top one you have was gonna be my moveset. Trained in: 255 speed and 255 special attack. 1. Hypnosis; A status move. Puts the Pokemon to sleep. 2. Nightmare; A special attack move. Inflicts a little damage every turn. 3. Dream Eater; A special attack move. Does damage, works well with Nightmare. 4. Shadow Ball; A special attack move. Why wouldn't Gengar have Shadow Ball, anyways? Good post! I tried this and love it! Gengar or Espeon for single battles? Toxic or Curse for Gengar? Hex or venoshock for Gengar? Is Choice Scarf Gengar viable?